Fortnite’s V5.41 update is now live and introduces a new consumable for both Battle Royale and the Playground game modes, as well as a new Horde Challenge and item. First up, the ‘Port-a-Fortress’ has been added to the Battle Royale mode. And, yes, it is what it sounds like. Throw the consumable down, and a huge fortress will appear, handy for those that are too lazy (or too busy getting shot at) to build their own constructs. You can check it out in the short video below. Next we have the ‘Spiky Stadium’, which deploys in a similar way as the Port-a-Fortress. Though it looks cute, it’s no less deadly than it’s Battle Royale counterpart. The Spiky Stadium has been introduced to Playground mode, so while you’ll have to watch out for the spike pads and bounce traps it contains, you’ll at least be safe from hostile players. Save the World mode gets a new Horde Challenge in which you’ll have to fight a lot of husks that are immune to all types of crowd-control. You will, however, have access to a new weapon, the Flintlock Launcher, seen below. 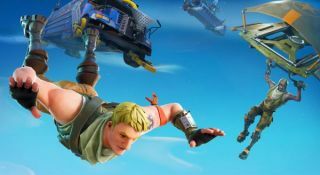 You can check out the full patch notes for Fortnite’s V5.41 update here.